Almost all imaginative people feel self-doubt. This tendency seems to be common to all creative fields: from English Literature graduate students to self-publishing Vampire-romance authors; from lifestyle coaches to graphic designers. In fact, the more we learn about the lives of great writers and thinkers, the more common this situation seems. We discover that everyone from John Keats to millionaire copy writers seems to have frequently felt that they were, basically, on balance, in the end — well, — kind of rubbish. While there is, therefore, probably no permanent cure for this condition, there does seem to be an effective treatment. The less lonely we feel as creative people, the happier we become, and the less time we waste worrying whether we are basically rubbish. The treatment is to increase the amount of time one spends in an artistic frame of mind. My newsletter offers you a weekly-ish dose of creative company. My goal is to share some information about one or two artists, living or dead, who may inspire you, as well as news about books, thoughts about craft and the writing life, and tips on forging a sustainable income as a creative person. 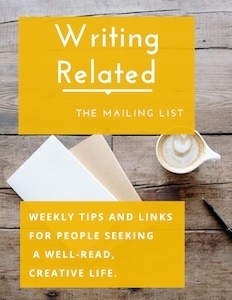 Sign up here to join “Writing Related,” the mailing list for people who like making things. Falling back in love with books. Being reminded why Virginia Woolf is amazing. Learning how to avoid distraction.